When the doors to The Lismore in downtown open late this year, visitors may be shocked to encounter a hotel property of its quality in a city the size of Eau Claire. That's the idea behind the massive overhaul of the troubled former Ramada Convention Center being undertaken by local ownership group Pablo Properties, led by Eau Claire native and JAMF Software co-founder Zach Halmstad. "We want to create a space that's a great fit for both people from Eau Claire and people visiting our community," Halmstad said after a media event Tuesday afternoon to unveil design details about the $16 million project that he projects could create about 100 jobs. 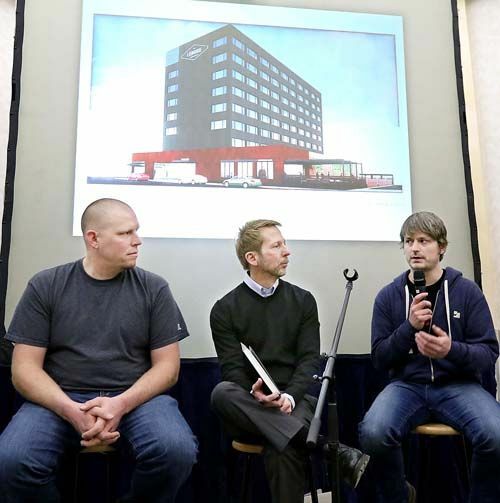 Superlatives about the planned hotel were flowing Tuesday as freely as the Pablo Properties team hopes the wine and craft beer do at the planned second floor bar with an outdoor rooftop deck. "For people coming to our community to visit and stay in the hotel, we really do want to give them something that they wouldn't expect to find in Eau Claire," Halmstad said. Developers indicated they are aiming to have the event space open by mid-2015 and the hotel with a restaurant, bar and coffee shop open by the end of the year. They are already booking meetings, weddings and other celebrations in the event halls for the second half of this year. The hotel will be affiliated with Hilton Worldwide's DoubleTree Hotel brand, and the bar and eateries will be operated by Terry Vajgrt and Paula Williams-Vajgrt, who are well-known in the area as the former owners of the popular Downsville restaurant The Creamery. The new restaurant, which will include outdoor patio seating, will feature an exhibition kitchen, wood-fire roasting oven and a farm-to-table emphasis on ingredients from local farmers, growers and foragers. The hotel transformation will involve every surface being rebuilt with new materials, said Brad Kemis of Eau Claire-based Market & Johnson, which will manage the construction. "This is going to be really something when it's done," Kemis said. The goal of the renovation, said Derek McCallum of design firm RSP Architects of Minneapolis, is to give guests an entirely different experience than they had at previous renditions of the downtown hotel, which had fallen into a state of disrepair. The hotel, which opened in 1976, closed Nov. 24, 2013, after three sheriff's auctions failed to turn up a new owner. Pablo Properties bought the eight-story hotel and adjacent convention center about a year ago. believes the hotel and convention center will be successful this time around. "None of the things that stigmatized it in the past will be left other than the memory." The interior design will incorporate a mix of reclaimed wood, steel, glass and metal into what McCallum described as a boutique environment that draws upon regional influences. "I think the aesthetic is going to be unique and yet give a feeling of familiarity," he said. Upon walking in the front door to the open, modern lobby with a central staircase up to the bar and entrances to the restaurant and a coffee shop with a stone fireplace, visitors immediately will recognize that the design is nothing like its predecessor at 205 S. Barstow St., McCallum promised. "The brand we're planning to develop here doesn't exist right now," he said, referring to putting this style of hotel in a market this size. "We don't have a precedent." As a result, McCallum referred to the project as an "expensive experiment," but one the owners are confident will be a success, both because of the excitement the property will generate and the positive impact of other downtown revitalization efforts. The ownership team, which McCallum called "the coolest group of guys to work with ever," has embraced the concept of taking risks and going the extra mile at all levels of the project much more than a typical corporate client, he said.